Ownership / Access: Jean-Jacques Matthieu de Wynendaele. Notes: Wijnendale Castle (Dutch: Kasteel van Wijnendale) is an historically important castle near the village of Wijnendale, now in the municipality of Torhout, in West Flanders, Belgium. The present castle is largely a 19th-century reconstruction, but a part of the north wing is still 15th century. One wing is inhabited by the present owners; another wing is a museum, open to the public. In 1833 the domain was bought by a banker from Brussels, Josse-Pierre Matthieu, who had the castle rebuilt between 1837 and 1852. His son Joseph Louis Matthieu modified it in 1877 and gave it its present romanticized, mediaeval form. In May 1940 Wijnendale made history again. On 25 May, just before the Battle of Dunkirk, there was a last meeting between King Leopold III of Belgium and four cabinet ministers (Prime Minister Hubert Pierlot, Minister of Foreign Affairs Paul-Henri Spaak, Minister of Internal Affairs Arthur Vanderpoorten and Minister of Defence Denis). With the country surrounded by German troops, capitulation was inevitable. The King however refused to follow his ministers to Britain to continue the struggle from there. He chose as commander-in-chief to remain with his troops and follow them into captivity. This decision led to strong controversy after the war, and to Leopold's abdication in 1951. 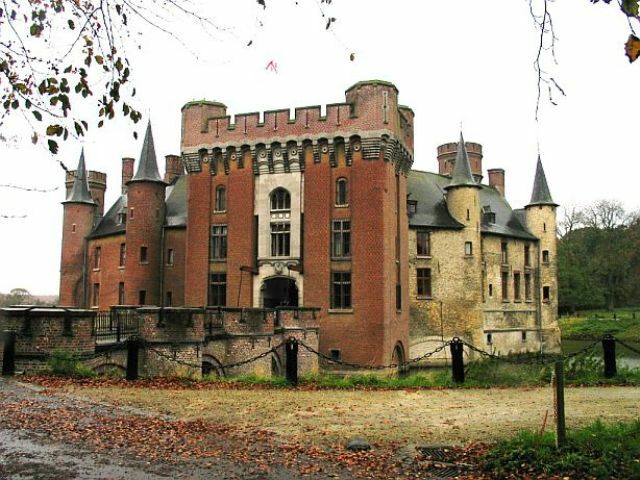 The Matthieu family (known since 1953 as "Matthieu de Wynendaele") still owns the castle today. The present owner is Jean-Jacques Matthieu de Wynendaele.